Despite ominous dark clouds (and a kite up a tree) an intrepid group of cyclists - including nine new, first-time riders - ignored the ill omens and gathered at the start to Wake Up The Earth at the KVBC ride in Manchester. The threatened showers never materialized. The sun actually broke through the clouds but the temperatures remained cool. It was great to see so many new riders and meet new people. We had several new folks sign up as members. Even better, two people even offered to lead new rides! It was a fine ride to kick off the season. 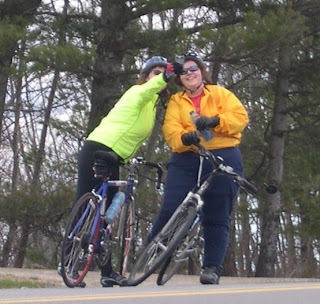 Stay in touch for details on upcoming rides. 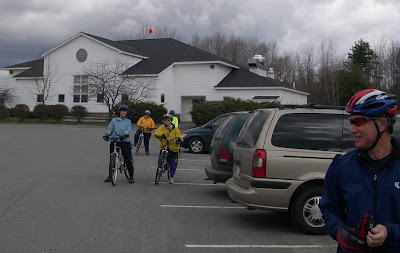 The next Kennebec Valley Bicycle Club ride is scheduled for May 2nd in Wayne. Hope to see you there! 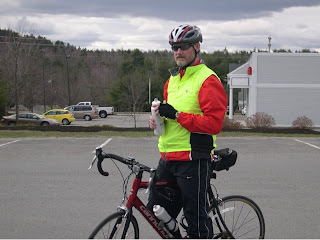 Secrets of Cycling Revealed - Kneesocks!